"I knew Biggie. But I don't want to be on TV, though. He the bomb, though, he the bomb. Well, he was the bomb." Nick Broomfield isn't the type of guy you'd expect to see directing a documentary about the high-profile murders of two rap superstars. Biggie & Tupac is the director's latest celebrity expos�, following Kurt & Courtney, which took a closer look at the suicide of Nirvana's lead singer, and Heidi Fleiss: Hollywood Madame. Unlikely an investigator as he is, Broomfield has nevertheless crafted a compelling profile of Biggie Smalls (a.k.a. The Notorious BIG) and Tupac Shakur, and dug up enough evidence about their murders to suggest a vast conspiracy involving the government, California police, and record producer Shuge Knight, who once managed Tupac's career. Seeing the pale, skinny Brit with Robin Leach's accent brave entrance into a maximum security prison to interview the infamous Knight, who is known for throwing death treats around without a second thought, is akin to watching Michael Moore trying to score an interview with Roger Meyers while dressed in a sweatshirt and jeans. The only difference is that Broomfield gets his interview (though his nervous cameraman has some trouble filming it). Broomfield's style echoes Moore's in other ways as well. He practices the same kind of guerilla tactics, traveling with only his cameraman, carrying the boom mic himself, ambushing those relevant to the case and trying to coax interviews out of them (usually with little success). He does have one very important interview on record�an LAPD detective who claims that he was pushed off of the police force for delving too far into the Shakur/Smalls murders. It is through this man's comments that Broomfield constructs his argument, that the official story about the killings (that they were motivated by an East coast/West coast rap rivalry) was a mere fabrication, and the deaths had more to do with the fact that Knight owed Shakur a lot of money. Broomfield also presents evidence to suggest that it was an off-duty cop who pulled the trigger in both cases, and he paints a disturbing picture of corruption among police, forty of whom he claims were on the pay roll for Death Row Records, Knight's label. I don't know if Broomfield has solved the case (there are certainly other compelling theories), but it does make for an interesting film. He constructs his argument by stringing together interviews with witnesses and associates of Smalls and Shakur, prying the facts out of them with persistent questioning. He is nothing if not dedicated, and more than once we seem him haggling for an interview while trying not to reveal exactly who he is and what he is trying to prove. Because his results are so scattershot, however, the film is more a fascinating piece of entertainment than a comprehensive documentary. Broomfield's presence is felt throughout the piece, and he is as much a character as the two slain rappers. In one sense, that is a positive�his methods are very creative and often highly amusing�but sometimes I feel like I am hearing a bit too much from him, and not enough from the pertinent parties. He provides nearly omnipresent narration, and much of it is awkwardly worded and repetitive. It often feels like he is trying to shoehorn in his conclusions without presenting enough evidence to support them. One thing is clear: no one knows for sure who killed Biggie Smalls and Tupac Shakur, and likely no one ever will. But Broomfield's theory is as good as any. Image Transfer Review: It's is a bit difficult to pt a grade on this transfer due the the constraints of the source materials. Broomfield shoots his footage on video, and though those segments look fairly clean, they do suffer from the washed out colors and flattened imagery of the format. He also makes frequent use of archival footage from the police, the media, and private collections, and the quality of this material varies greatly�some of it is very rough and sorely lacking in detail. Overall, though, the DVD transfer seems fine, and any problems are due to the film itself. Audio Transfer Review: Audio is presented in a simple stereo mix. Broomfield's narration is always clear, but it sounds unsupported and tinny, and placed low in the mix. When music is used, it tends to sound a bit airy as well. Audio on the catalog footage varies as much as the video; some of it sounds pretty rough. Extras Review: Director Nick Broomfield contributes a number of interesting supplements to this release. Most substantive is a commentary track for the feature that allows him to delve more fully into subjects only hinted on in the film, or to explain what was going on during a given day of shooting. He has a lot of interesting stuff to say, and though the film stands alone, the commentary adds to it quite a bit. Broomfield also offers some historical perspective and making-of information in a 13-minute interview feature. A collection of 15 deleted scenes offers some odd material from the cutting room floor, including some original raps from participating musicians, and a few failed attempts to obtain interviews. Additional Information offers detailed bios of many of the case's relevant parties, and it's a helpful resource for keeping track of all the conspirators. Discographies for Tupac and Biggie and a filmography for Broomfield offer more background information. Closing out the extras is a bit of text information on the charitable organization that was established by Biggie's mother after his death. The back of the box promises a trailer reel, but it isn't included on the disc. 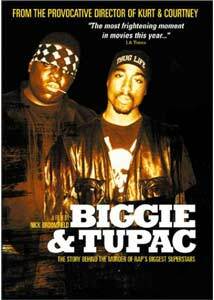 Biggie & Tupac is an interesting piece of investigative journalism, a step by step investigation presented in film form. I'm not convinced that Nick Broomfield has solved the murders of Biggie and Tupac, but he has made a compelling argument. DVD newbies Razor & Tie have done a nice job with this release, offering up a decent transfer and a strong package of supplements.